After reading, My Garden by Kevin Henkes we decided to do an experiment to find what kinds of beans will grow and what kind of beans will not grow. In My Garden, a little girl helps her mother tend a garden. She dreams of her own garden. In her garden, bunnies don't eat the plants; they get eaten because they are chocolate bunnies. 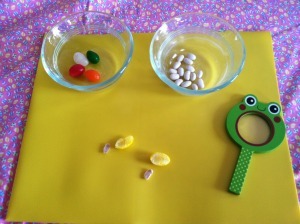 She dreams up a garden where jellybeans grow into jellybean bushes and seashells grow shell plants. This is a wonderful book for enticing the imaginations of young gardeners. While the book does provide hope for producing a sea shell garden, we had to do a little experimenting ourselves. 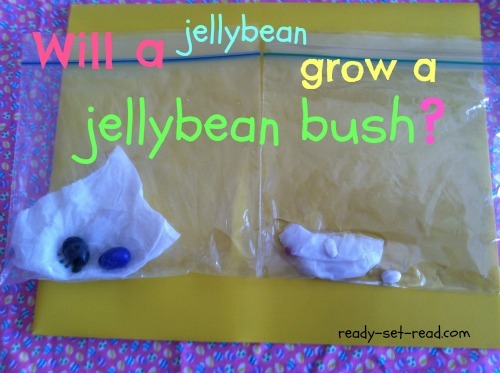 We posed the question, "Will a jellybean grow a jellybean bush?" We then put beans into plastic bags with a moist paper towel. We will check back to see which ones sprout. Mommy is holding out hope for a jellybean bush! Love this idea! It would be a great way to start our plant unit! Thanks for sharing! 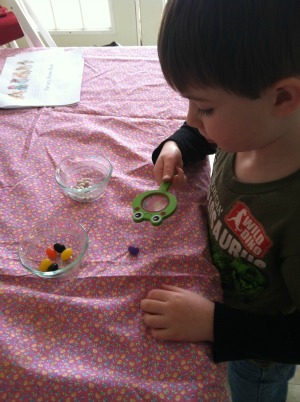 I am having a “Spring Break Bucket List” linky party...stop by and link up! Cute idea! I love the book tie in too! You are right, it would be a good "hook" for the beginning of your unit. I"ll stop by your linky party too. Thanks for the info about the blog hop. What a cute idea! Thanks for sharing with Mom's Library! Thanks Ashley for stopping by from the link up! haha. fun. you should try planting a dollar too, just in case. . .
great idea! It's probably worth a try... ha! Thanks for the comment! Just wanted you to know I am featuring you this week on Mom's Library! Oh, and I'm with Erin, if the jellybean grows, you should plant a dollar tree too! Sweet! Thanks for the feature, Ashley. I'll check it out tomorrow.